Legendary Suicune - Part 3! Pokemon One a Day, Series 2! And the experimentation comes to a close, with a bang might I add! Boy, I am very happy with this turn out as I end the three day procedure with one of my all time favorite Pokemon, Suicune! I gotta say, just having this last bit of the puzzle really amps up the piece big time. 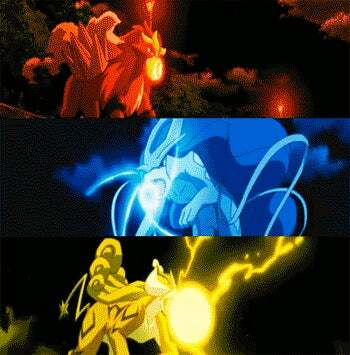 Raikou has since stayed in the same spot throughout the work, but the others got reworked with how I saw fit. In the end, Suicune sorta gets the spotlight but not just because of bias but because he’s sorta the leader of the three in an unofficial capacity. 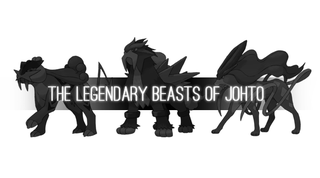 In the grand scheme of things, I feel Entei maybe is the big bro of the gang. He’s the middle, and the biggest. However, Suicune gets a lot of love via the anime and of course, is the version mascot of Crystal version, so his visibilty factor is on another level compared to the the two. Not to mention that in the games, he was the only roaming Pokemon to then stop and be stationary to meet you. That said, Suicune sorta gets full body treatment to plant the composition in, while the others are flanking him. Now, to go into detail: Raikou was posed as such to be envisioned as lightning striking from the ground (vertical pose). Entei is at a slant, attacking in the way Volcano slides down from the top. Suicune, emissary of water (and Northern Lights, which is so badass btw) is known to purify the water, so I had the water ripples touch down on his feet. OK, so what about the circle behind them? Of course that has an explanation too. The circle represents their cycle of birth, death, and rebirth. Also, the colors aren’t just for the sake of making up their respective elements as a backdrop - they follow the spectrum of the rainbow, who represents Ho-Oh, their saviour. Pretty neat, huh? Of course, as I took breaks on Suicune, I made sure to touch up Entei (whose pose got slightly altered from yesterday, and Raikou, who was shifted in a slight way. They got their boost in visual effect and I made sure to have them nicely presented in equal footing. So there you go! Whew, this was a tough one! I was scared maybe this experiment might backfire or come out a mess, but I’m extremely happy with this piece! I hope you guys had fun watching it evolve over the last 3 days, and now I’m thinking maybe Lugia and Ho-Oh might get similar treatment...What do you think?